As a child in the 1990s, my parents decided to buy a new VCR that had a novel feature in that it could speak the time when a button was pressed on the remote. This resulted in endless hours of me repeatedly pressing the button until it drove my parents to insanity. The clock time I found most hilarious was 11:11 because of the way that the computer voice spoke. After that, I began to notice 11:11 everywhere, a strange symptom that has followed me ever since. Some examples can be seen below. For many years, I thought I was the only person who experienced this. Then I was shocked to discover that it is actually a common phenomenon. Just a quick Google search of ’11:11 mystery’ will bring up numerous websites and examples of people who have experienced the same recurring pattern. It also appears that the experience is not just limited to 11:11. People also see other reoccurring sequences of numbers, seemingly tailored to them by some unknown force. How many times have you glanced casually at a clock only to find that the time is 11:11? So what does it all mean? Is it a message, a sign from the Universe, or just random chance? If it’s a message, what does the message tell us? There have been many opinions, but few conclusive answers. 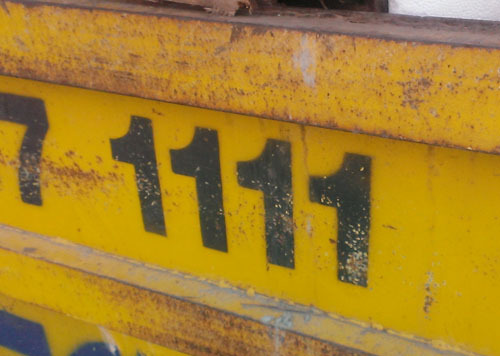 This 1111 appears on a skip just down the street from my apartment. Similarly, there are connotations between the number eleven and death. Notable dates such as 9/11, or ‘the eleventh hour of the eleventh day of the eleventh month’ in 1918 when the hostilities of the First World War officially came to an end, are just two examples. However, perhaps there is a more mundane explanation. The human brain is undeniably wired to see patterns in nature. The psychological term ‘apophenia’ refers to the human experience of seeing patterns or connections in random or meaningless data. This experience can also apply to numbers. The theory suggests that if you are looking for a particular numerical pattern, you will probably find it. 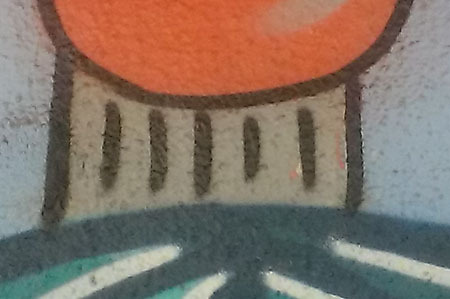 A section of a mural painted on an underpass near my home. So can we come to any firm conclusions as to the true nature of the 11:11 phenomenon? Perhaps not, but it is worth noting that a common belief amongst scientists is that mathematics is a universal language – a concept that would need to be understood by any advanced civilisation. Cosmologist Max Tegmark has even gone as far as proposing that the Universe itself is a pure mathematical construct. If this is true, then it would make sense that our reality would use numbers to communicate with us. And, if we are as much a part of this cosmological construct as our surroundings, then perhaps we can look to find the meaning of these signs within ourselves.